This setting pushes a lot of my buttons, but "Pathfinder" is definitely not one of them. And I don't find any news about migrating to Starfinder or 5E. In fact, I don't find any news at all - Facebook, Twitter, the project's homepage, they're all silent since late 2017. Any chance we will be getting a Starfinder update and subsequent physical copy? Yes! We are currently updating the monsters, character races, and a number of other elements from Aethera as part of the Alien Bestiary (monsters, aetherite) and Alien Codex (races, gear, feats). Once those are completed we will likely do a final sweep for other rules elements not yet covered, such as the cantor class and archetypes, and combine all of those elements into an Aethera Starfinder Companion (and an Aethera 5E Companion as well). We won't be republishing the entire book, as 2/3 or more is lore and flavor that can be used with any system, but an alternate rules compendium is definitely in the works for those systems. I really like the starship rules, are you (writer) planning an expansion with more equipments and basic hulls, and/or some other expansions? We do have the "Aethertech Manual" in the works, which includes additional gear as well as spaceships, which should hopefully be done by the fall. Now that the Starfinder PDF is out (for some) how well does this campaign setting fit in with the Starfinder rules and/or campaign material? Is it a good mesh, such that one could use this to expand the SF material into a mixed custom universe? And speaking more broadly, what about mixing in stuff from Spelljammer, Star Wars D20, Traveller T20, or other "space" games, is this setting flexible enough to have storm troopers and jedi mixing it up with illithids and space dwarf mercenaries? In my opinion, it depends. You can take some things and use them, races and items for example, other things aren't so versatile. Starships rules, for example, are so much different in every single scifi setting that i've tried, nearly incompatible with each other. The Aethera setting is really good, and i think that it can be used as the present state of Androffa in the normal Pathfinder game. Regarding stormtroopers, jedi and illithids, every case is different. Illithids are stuck in the 3.5 edition rules, so you have to adapt them to pathfinder, same thing for the jedi class of star wars D20. The stormtroopers can be created givin weapons and power armors to soldiers, so you can create them with the rules of the Aethera setting. Are the paragons of Orbis Aurea a race? If that's so, where can we find their base stats, and/or more informations about their nature and their creation? The paragons of Orbis Aurea are a unique set of beings, and their stats and lore will be presented in the upcoming "Aethera Field Guide," which should be coming out in July for Pathfinder and thereafter for both Starfinder and 5E. Are there plans for a print copy of this? We did a full print run and the books are en route to us, scheduled to arrive in July. You can preorder the print book at the Legendary Games website. The print version will be available on here too though, right? Not on DrivethruRPG. This site only sells print copies of print-on-demand books produced through their POD partner, LightningSource. They do not consign, host, or sell books printed elsewhere. We'd love to sell you a copy at the Legendary Games website, though! Are there any plans to publish this (or perhaps a supplement) for 5e? The original project was Pathfinder-only, but we are definitely considering a 5E supplement down the road. A lot of this book is flavor and setting material, so given its size we probably would lean towards creating a 5E conversion guide rather than doing a cover-to-cover redo of the entire book. We'll keep you apprised as things develop. OMG I'd love for this to be 5e, like how you did Hypercorps 2099 for both systems. I don't really play Pathfinder and the premise of this setting is so good that its something I am going to purchase. Is there an adventure in this book for this setting? We have a series of adventures for the Aethera setting coming out this year, the first of which have completed art and manuscripts but are in the editing and development phase prior to layout. Those will be available this summer, with two more to follow in the fall, plus more in progress for next year. 2) if yes, I cant find the English version anywhere on this site. 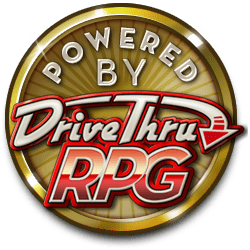 Can you provide the link for legally buying the PDF on drivethru rpgs? You'll have to buy the PathFinder core at the Paizo website. The only titles they have here are some of their published works of Dungeon & Dragon magazines.